The Gay Gamer: This game isn't going to be released outside of Japan, is it? This game isn't going to be released outside of Japan, is it? If you're anything like me, you've always wanted to own a game that lets you create songs and then have them performed--with digitized/synthesized singing--by a band of Rodney Greenblat-esque monkeys. 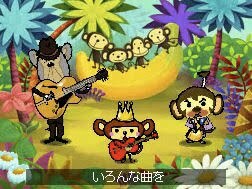 Well, you're finally going to get your chance to own such a game next week, when Nintendo publishes--in Japan, harumph--a DSiWare title called Tsukatte Utau Saru Band (aka Make and Sing: Monkey Band). The 800-point game was made in partnership with Muu Muu, the developer behind the similarly strange PS2 title from 2003, Kuma Uta (aka Bear Song), which starred a polar bear who, you guessed it, performed user-created songs using digitized/synthesized speech. How completely bizarre! And no, you're never going to see it in the U.S.